1) How do I select a ladder suitable for me? 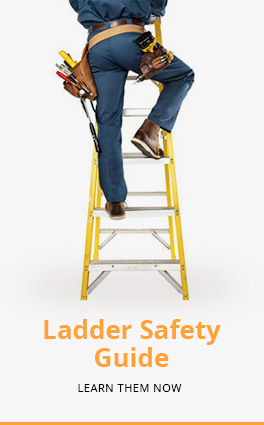 If you are anticipating electrical hazard, we would recommend selecting a ladder from our range of fiberglass ladders. Our fiberglass material is independently verified to have dielectric strength far exceeding the industry standard of 35kV/in. Otherwise, our range of aluminium ladders would be suitable for most other uses, such as for industrial or household use. All our products have its own ladder sizing table containing pertinent information such as reach height. length, thickness, weight etc., along with diagrams showing method of measurement and estimation. If you need more help choosing a ladder or have any special requests for customizing a ladder, feel free to contact us. 2) How long will it take for my purchase to ship? Shipping lead time would not usually exceed 7 working days from the placement of order. Orders paid before 12.00pm on Monday-Friday (except for public holidays) will usually be shipped on the same day if the product is in stock. 3) Do you ship to Sabah & Sarawak? Yes. Please contact us for the best shipping arrangement and quotes. 4) What are your return policies? Goods sold are not returnable or exchangeable. However, we warrant that our products should be free from manufacturing defects. In the rare occasion where a manufacturing defect occurs, please contact us so that we may assess and remedy the situation to the best of our abilities. Due to the nature of the application of ladders, damages from misuse, negligence, and normal wear and tear are not covered by our warranty. 5) Can the damaged parts on my ladder be replaced? As the manufacturer of Winner Ladder, spare parts and accesories such as tool tray, hinges, rubber shoe, etc. are always available. To prolong the service life of products purchased from us, we offer repairs and parts replacement for a reasonable cost at our factory location. Contact us if you have a need for service to obtain an estimate.